The Nikon D300s is packed with pro features at a consumer price of less than $2,000, making it a camera both pro and beginning photographers will be looking to scoop up. Newcomers to the D300s can rely on this easy-to-understand book to guide them through the essentials of the camera's controls and how to adjust them in order to get results you want. Assuming no previous dSLR experience, veteran author Julie Adair King helps familiarize you with the features of the D300s and provides you with an overview of the camera body and automatic settings. You'll quickly learn to apply what you've learned to any shooting situation. 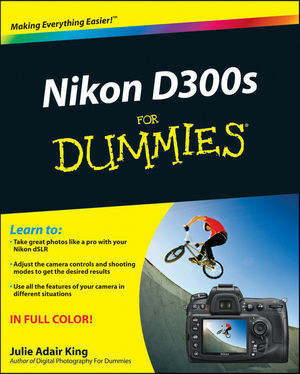 Set your focus on learning the essentials of the Nikon D300s with this friendly guide by your side! Julie Adair King has written six editions of Digital Photography For Dummies as well as other For Dummies guides on specific Nikon and Canon dSLR cameras. She has been writing about digital photography for more than a decade, and also works one-on-one with beginning digital photographers at the Palm Beach Photographic Centre. Part I: Fast Track to Super Snaps. Chapter 1: Getting the Lay of the Land. Chapter 2: Fast and Easy: (Almost) Automatic Photography with the D300s. Chapter 3: Controlling Picture Quality and Size. Chapter 4: Monitor Matters: Picture Playback, Live View, and Movie Recording. Part II: Taking Creative Control. Chapter 5: Getting Creative with Exposure and Lighting. Chapter 6: Manipulating Focus and Color. Chapter 7: Putting It All Together. Part III: Working with Picture Files. Chapter 8: Downloading, Organizing, and Archiving Your Picture Files. Chapter 9: Printing and Sharing Your Pictures. Chapter 10: Ten More Ways to Customize Your Camera. Chapter 11: Ten Features to Explore on a Rainy Day.